Last night I made my favorite Thai dishes: Evil Jungle Prince with Chicken and Eggplant & Bok Choy with Bean Sauce. United Noodle (my local Asian grocery) was out of the japanese/chinese eggplants (the long skinny purple ones) so I used Thai eggplants (round and green) instead. They don’t hold together as well in the dish, but it tasted just as marvelous as ever. I used to be able to buy jars of Chili Garlic Paste and Yellow Bean Sauce that I liked. But my preferred brand of Chili Garlic Paste is no longer available and the “starch” included in the Yellow Bean Sauce became suspect. So now I make my own. 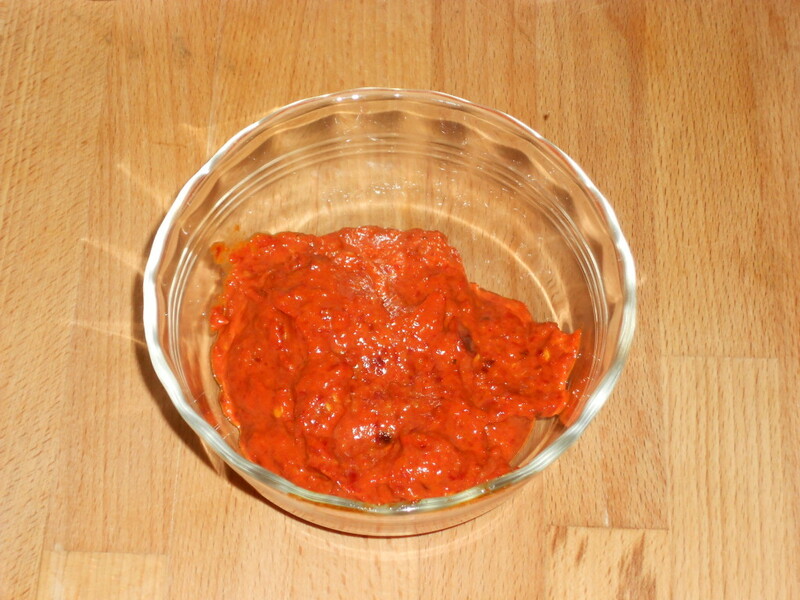 I combine the ideas from the two recipes cited above and use a combination of dry and fresh chilies, soaked in boiling water with a few cloves of garlic and then pureed in food processor with salt, sugar, and some oil. If I’m going to use the paste within a day, I just store it in a glass bowl until I need it. If I’m going to store any of it, I heat it first (in an attempt to kill off any bacteria from the fresh garlic and chilies) and then store in the freezer. Put the chiles and garlic in a small bowl and cover with boiling water. Soak for about 30 minutes. Drain, reserving some of the water and seeds. Cut the larger chiles into smaller pieces. Put all the ingredients into a food processor, blender, or mini-chopper. Purée until smooth, adding oil or water if needed. Heat in small saucepan over medium heat until bubbly. Will keep for several days in the refrigerator or longer in the freezer. I haven’t found a good explanation of the difference between Thai Yellow Bean Sauce and the more familiar Black Bean Sauce. I do enjoy Black Bean Sauce, so even though it probably makes my Thai dish more “fusion,” I decided to use Black Bean Sauce in the Eggplant & Bok Choy dish instead of Yellow Bean Sauce that contains “starch” of undefined origin. Note that these are not the same as the black beans you would use for mexican food. They are fermented in salt. I store mine in the freezer. 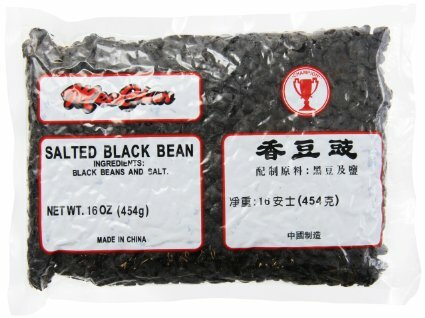 Place fermented/salted black beans in a small saucepan and add water. Leave to sit to rehydrate the beans (approx. 30 minutes, can be done earlier in the day). Heat over medium heat until bubbly and thickened. Stir occasionally. 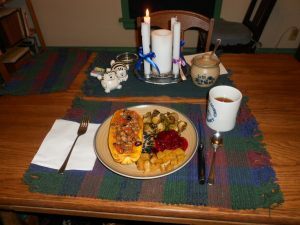 Those of us with food sensitivities often are confronted with social food situations where we know “if I eat any of this, I’ll be sorry later” . . . but we want to be polite. So we pick the things that seem “relatively safe.” I’m pretty good at avoiding the likely culprits. And lucky for me, I won’t end up in the hospital if I am accidently exposed to gluten, dairy, or corn. But that doesn’t mean I won’t suffer: intestinal distress (gluten), sinus trouble (dairy), hives (corn). 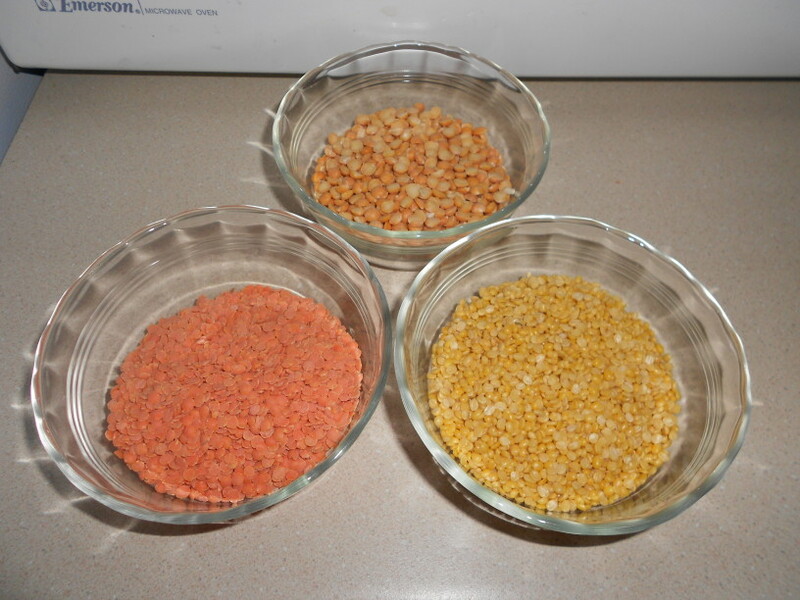 Rinse split mung beans until water runs clear. Soak 4 hours or overnight; drain and rinse. Get water boiling if it isn’t already. Warm oil in large sauce pan or Dutch oven. Add cumin seeds and ginger and sauté for 1 minute. Add drained mung beans. Sauté for another few minutes. Add 4 cups of boiling water and pinch of baking soda. Bring to a boil and then turn down heat to low. Cover and simmer for 20 minutes. Meanwhile measure out remaining spices (cumin, coriander, turmeric, cinnamon, clove, cardamom), prepare sweet potato, and rinse rice. 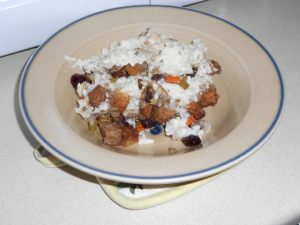 When beans are mostly cooked (after about 20 minutes), add rice and sweet potatoes. Add remaining 2 cups boiling water. In a separate small pan, heat 1 Tablespoon oil. Add spices. Warm over low heat just long enough to release aroma. Be careful not to burn. 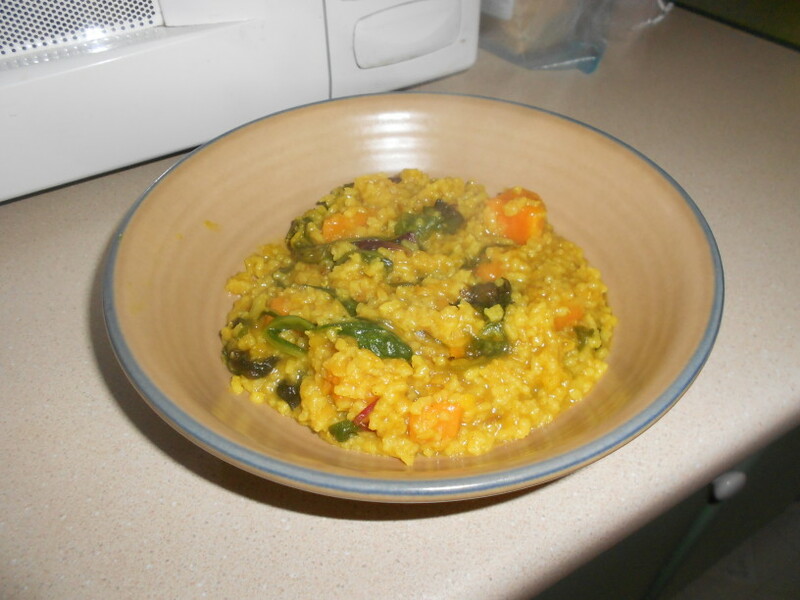 Add to bean/rice/sweet potato mixture. 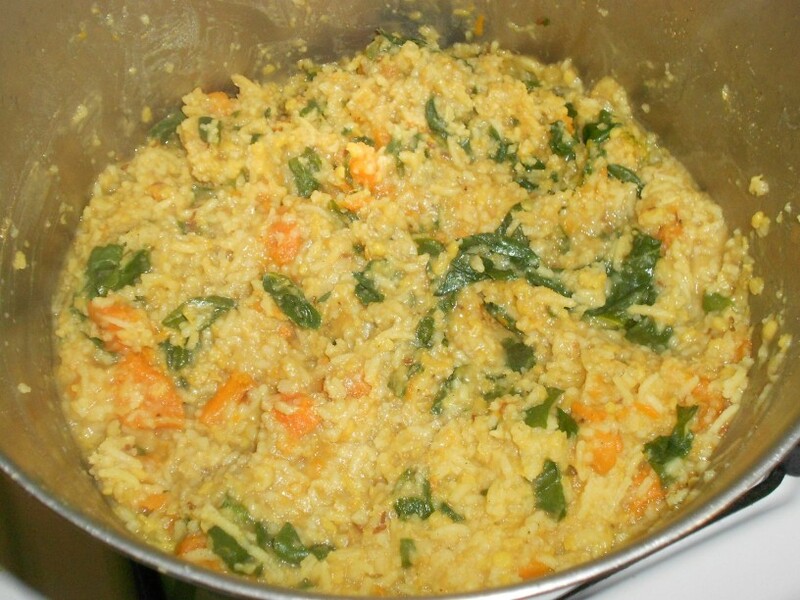 Continue cooking at a simmer until rice is done, 20-30 minutes, stirring occasionally. Add chard. 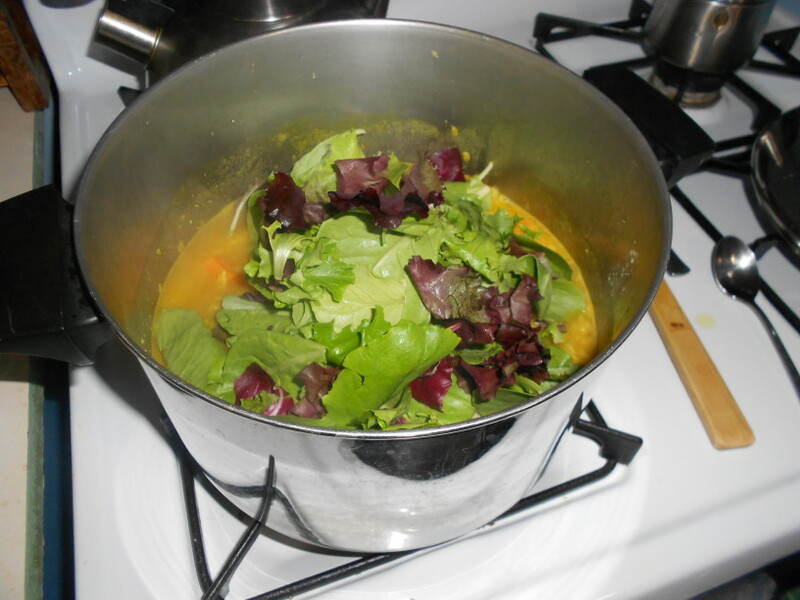 Cook until greens are wilted and combined with the rest of the ingredients (5-10 minutes). 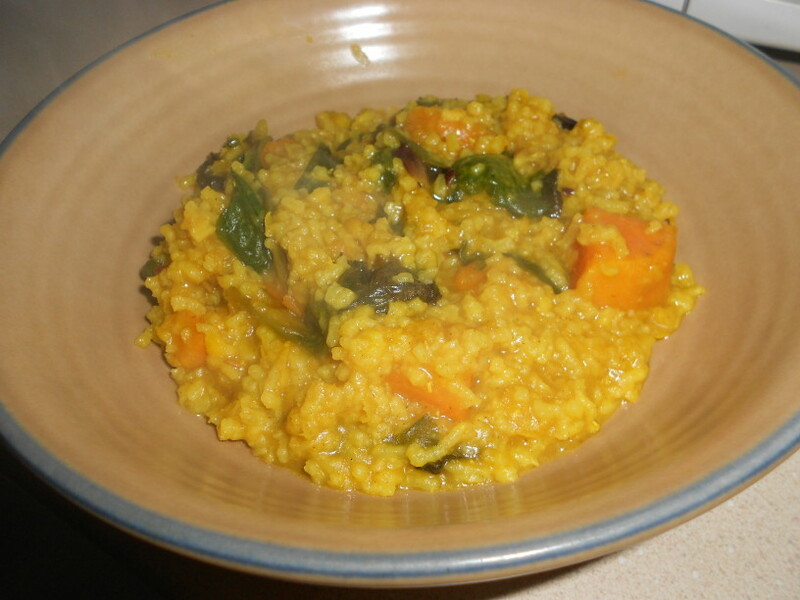 The original recipe called for a pinch asafoetida (hing) added with the cumin seeds. I tried to find hing that didn’t also include gluten and/or corn starch. Unfortunately, my body reacted to the one product I found that said it was gluten-free in a way that told me there was something in it that I shouldn’t be eating . . . so even though this is a traditional “healling” ingredient in Indian/Ayurvedic cooking, I omit it. Kale or other leafy greens can be substituted for the chard. 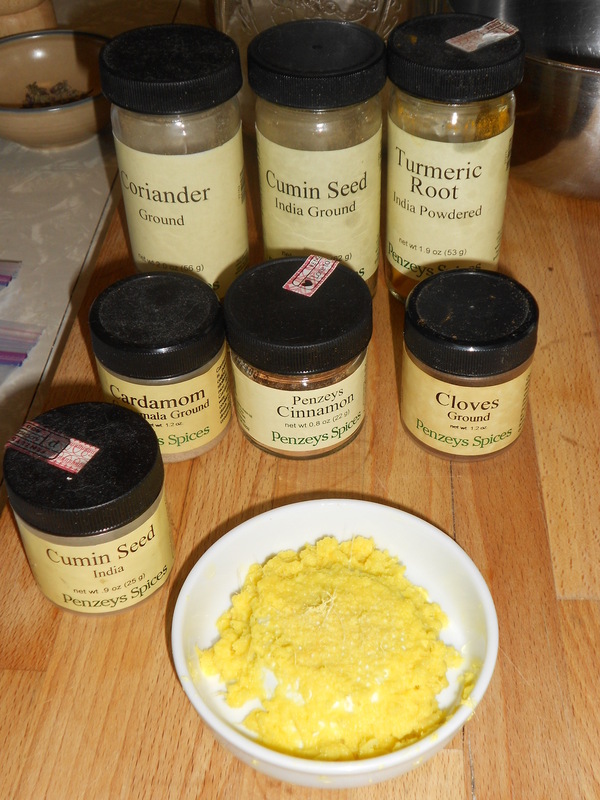 Sometimes I heat all the spices at the beginning (with the cumin seed and ginger) rather than waiting until later. The flavor is a bit different and there’s a greater danger of burning the spices, but it can work (and leaves one less pan to wash and frees up one more burner). 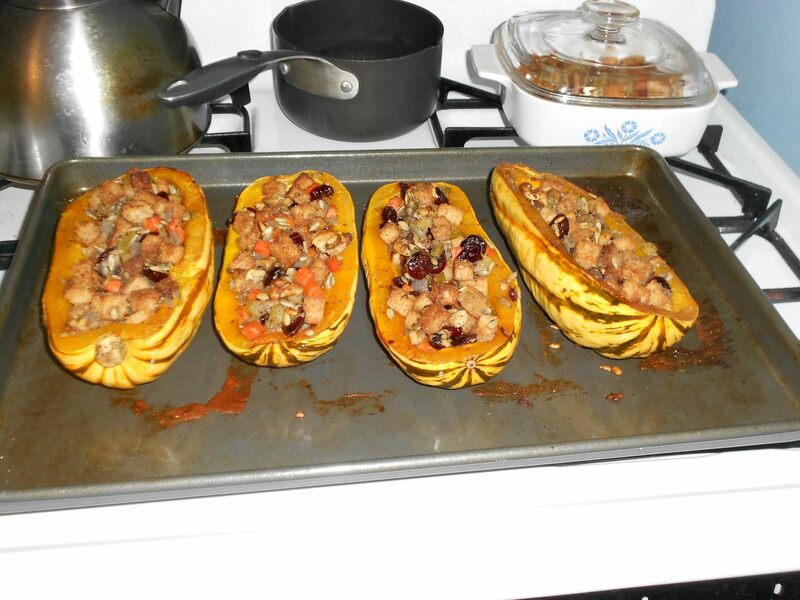 The original recipe claimed that this recipe “Serves 2-3.” I usually get 5-6 serviings out of it. Start the water boiling in your kettle. 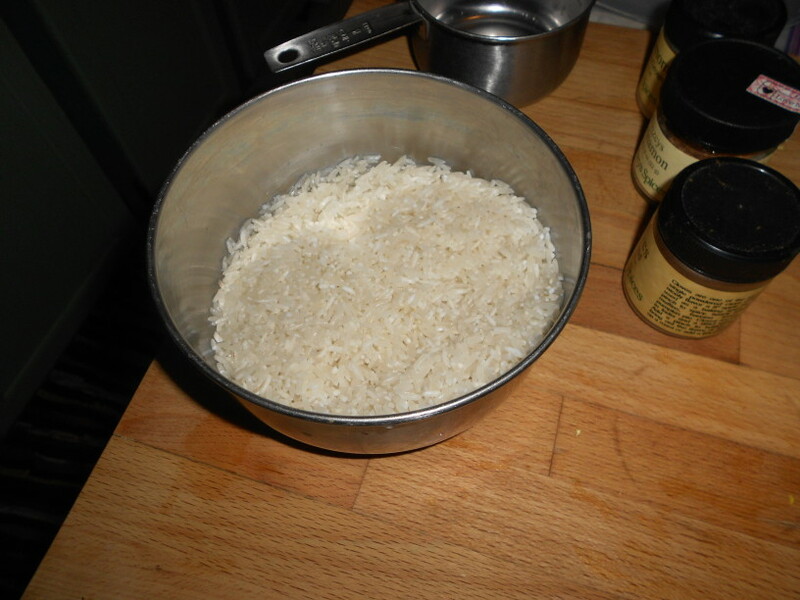 In a small cast iron pan over medium heat, lightly the brown rice farina, stiring frequently until the farina is light brown in color. Remove toasted farina to a bowl and set aside. Melt the coconut oil or ghee in the cast iron pan over low heat. Add the Spice Blend. Let spices warm for 10-15 seconds. Add vegetables and a small amount of water. Stir. Cover and cook vegetables for 5-7 minutes. 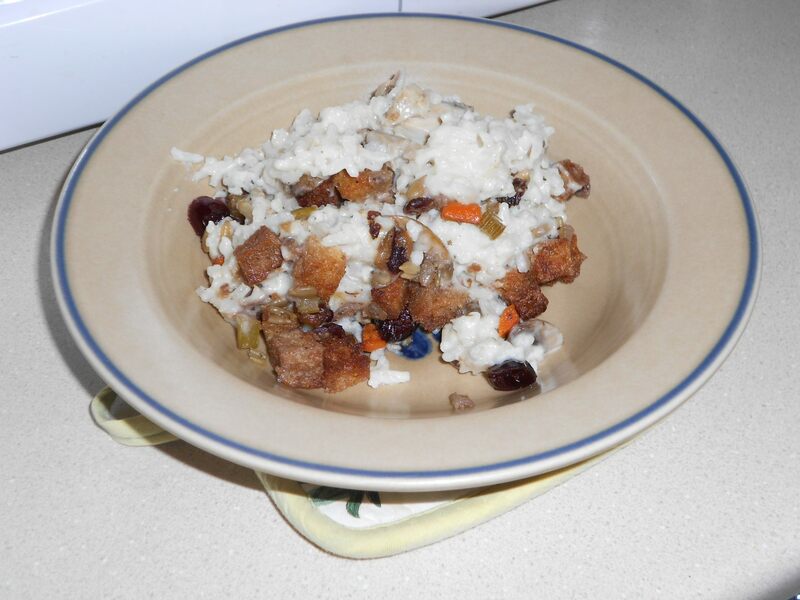 When the vegetables are cooked, add the toasted farina and stir to coat. Add 1 cup boiling water and a dash of salt. Cook for approximately 5 minutes, stirring frequently as farina thickens. Combine all the spices in a glass jar. 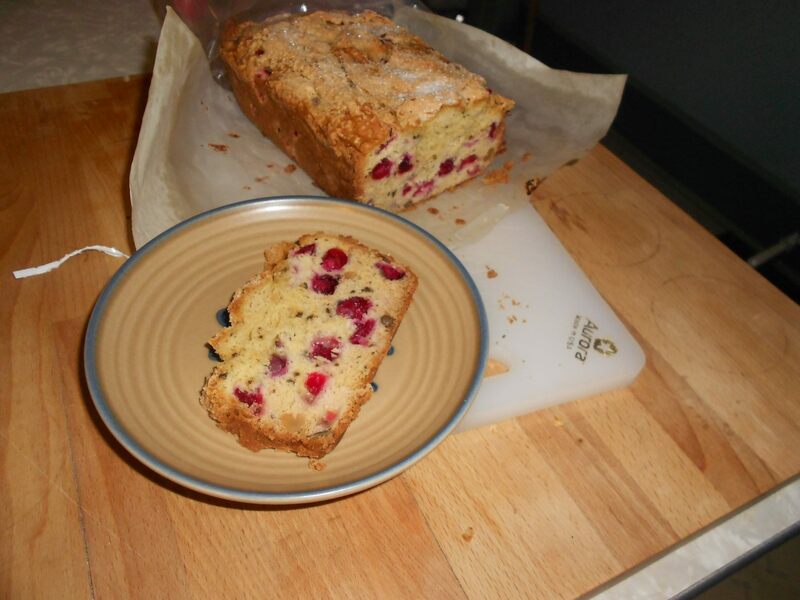 Use 1-1/4 teaspoons (or a heaping teaspoon) for each serving. 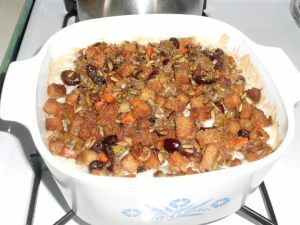 I’ve only made this dish one serving at a time, but it should work if the ingredients are doubled/tripled/quadrupled. You might need to adjust water quantity, spice quantity, and/or cooking times. Other vegetable options: chopped onion, minced ginger, chopped yam or sweet potato, asparagus, leafy greens, or whatever else sounds good. 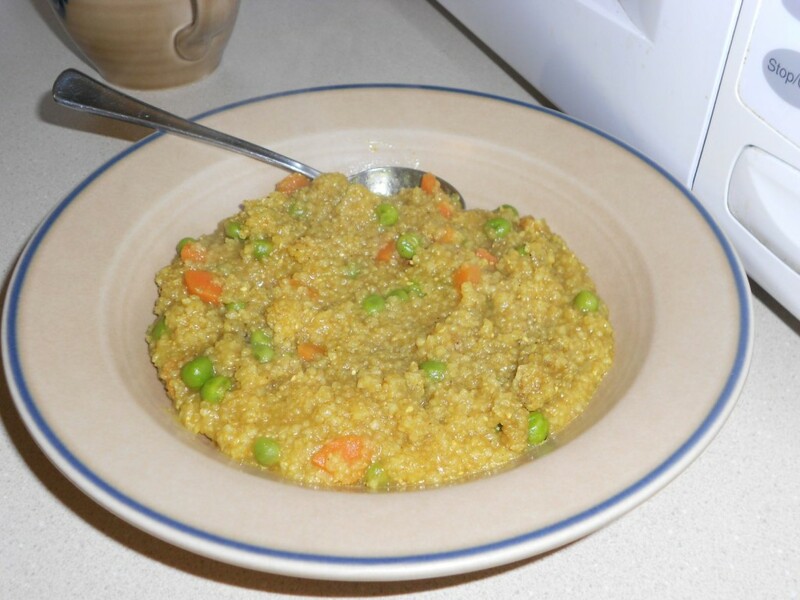 I’m guessing this dish could be made with other grains (e.g., wheat farina or grits), but I haven’t tried that. You might have to adjust cooking times. WOW! That’s quite a bit of information. Please let me know (in the comments) if anything needs clarification. Saute the chopped mushrooms in oil until they lose their liquid and start to brown lightly. Add the turkey and saute a few more minutes to warm it up. Add thyme and mix thoroughly. Meanwhile, make a thin white sauce. Melt/heat 3 Tablespoons oil/shortening in a medium sauce pan over low to medium heat. Sprinkle in the GF flour blend 1 Tbls at a time, whisking to combine with the oil and avoid lumps. Cook this roux for 2-3 minutes. 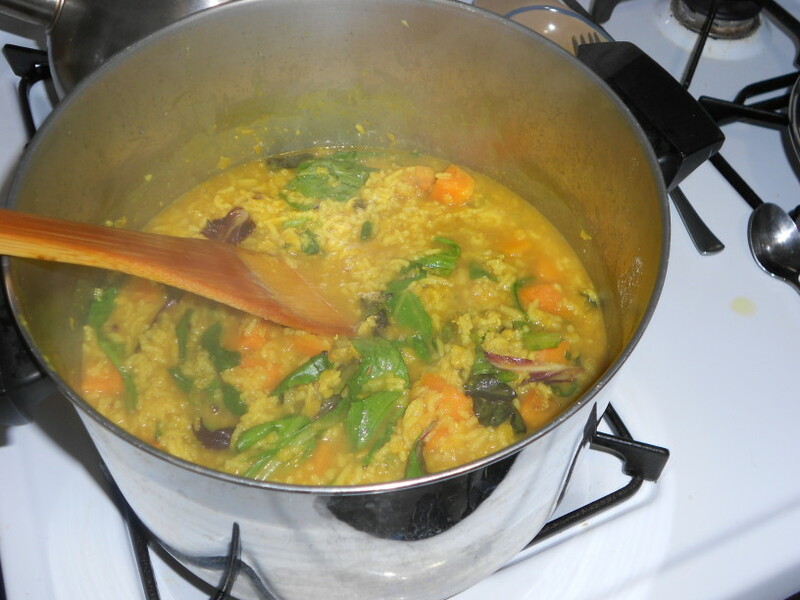 Gradually add the coconut milk/stock (about 1/2 cup at a time), stirring/whisking to avoid lumps. Once all the liquid is added, heat over medium heat, stirring occasionally, until the white sauce coats the back of your spoon. Stir in salt & pepper. Today I took the white sauce up a notch by including a big spoon of leftover turkey gravy, mixed in with the roux before adding the coconut milk and stock. YUMMO! Today I baked the latest in my attempts to develop a gluten-free version of my old favorite “Raw” Apple Cake with Cream Cheese Frosting. 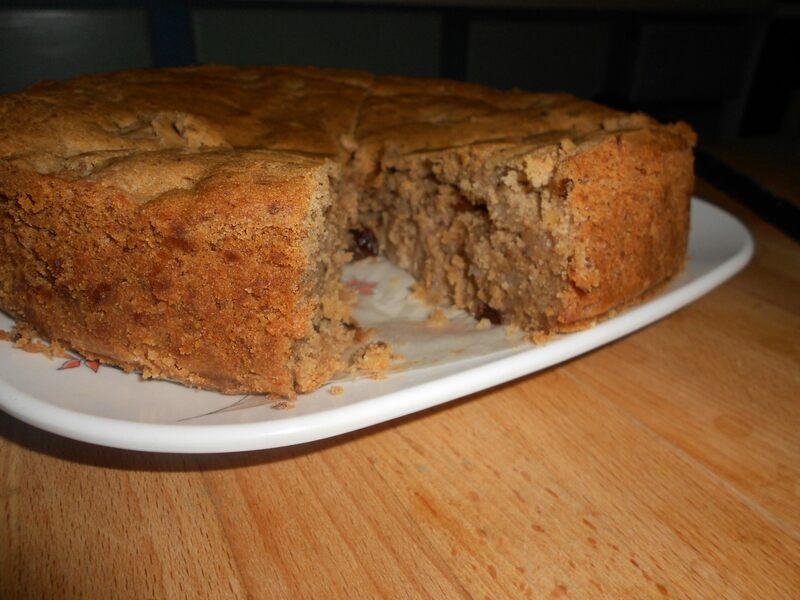 This time I used Cybele Pascal’s Allergy Free French Apple Cake as a place to start. Her main innovation is pre-cooking the apples. I added raisins, walnuts (so no longer “top allergen free”), and spices (so less French, more American) to her recipe and made several other changes to make it corn-free. Below is what I did. Consult the links above for the original recipes. 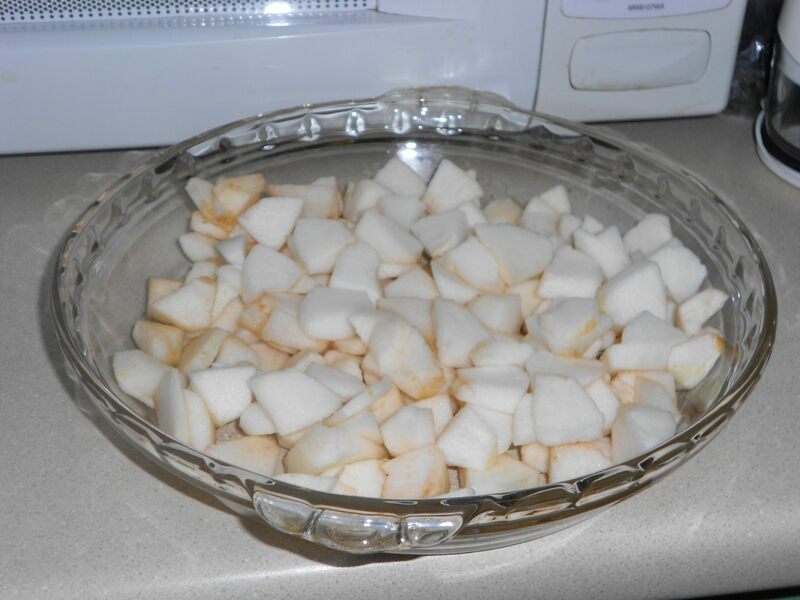 Place apple slices in a microwave-safe pie plate, cover, and microwave 3 minutes or until apples are slightly tender and pliable. Toss with brandy and lemon juice, and set the pie pan on a wire cooling rack to cool. Preheat oven to 350°F. Line a baking sheet with aluminum foil. Grease a 9-inch springform pan. 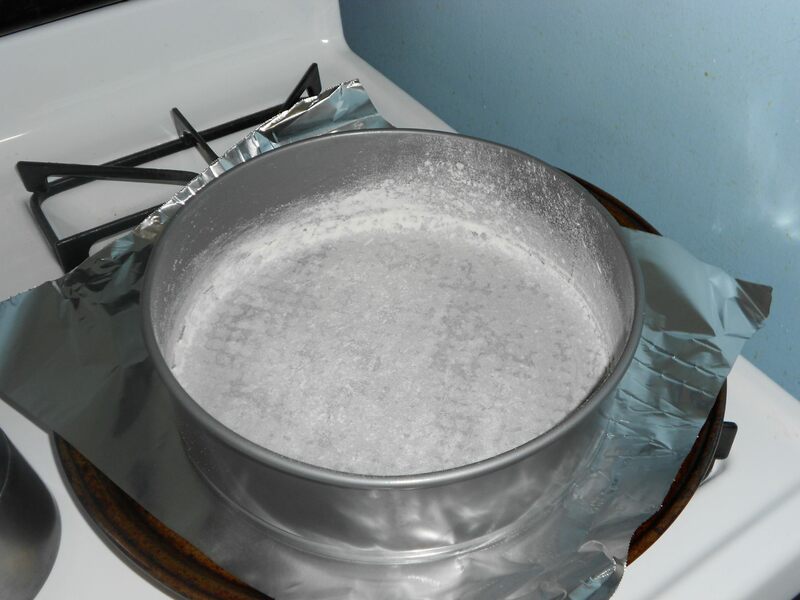 Line the bottom of the springform pan with a 9″ round piece of parchment paper and grease the parchment paper. Sprinkle the sides and bottom of the pan with a little gluten-free flour mix, tapping out any extra, and place the springform pan on the baking sheet. In a small bowl, combine flax seed meal with warm water. 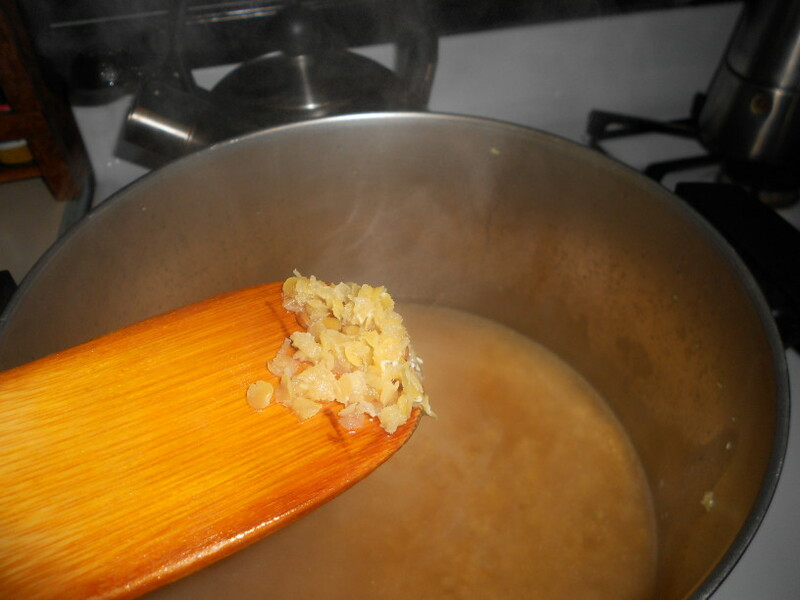 Set aside for 5-10 minutes, stirring occasionally. It should thicken into a gel similar in consistency to eggs. 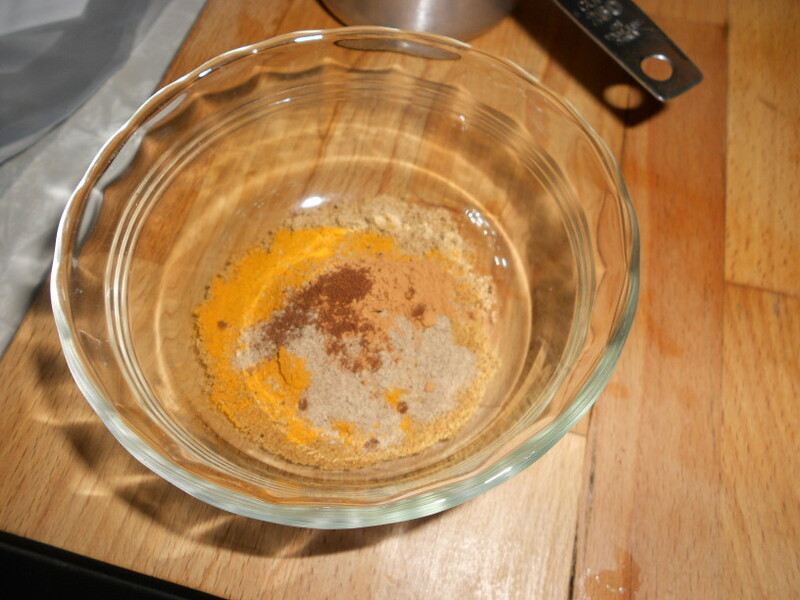 In a medium bowl, whisk together the flour mix, guar gum, baking soda, cream of tartar, salt, cinnamon, allspice, and cloves. Set aside. In a large bowl (or the bowl of a stand mixer), combine shortening, light brown sugar, and granulated sugar. Mix on medium-high speed until well combined. 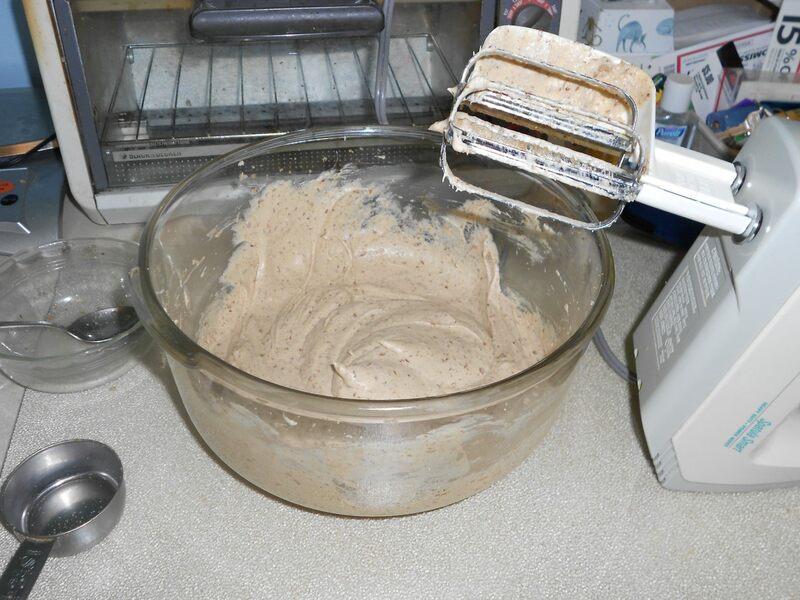 Add flax seed mixture and vanilla. Mix until blended. 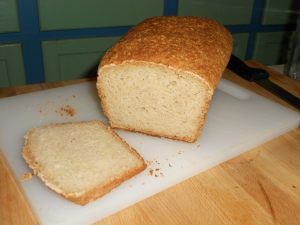 Reduce the speed to medium and beat in one-third of the flour mixture. Mix until blended. Add half the coconut milk, mix until blended. Mix in half of the remaining flour mixture, then the remaining coconut milk, and finally the remaining flour mixture, scraping down the sides of the bowl as necessary. Using a wooden spoon or rubber spatula, fold in the walnuts and raisins. Then gently fold in the cooled apples. 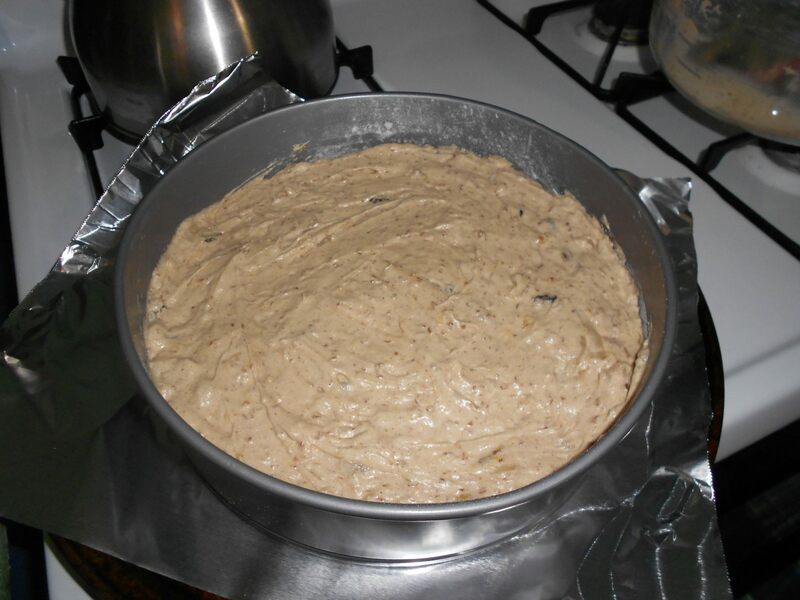 Pour the batter into the springform pan; spread to the edges of the pan and smooth the top. 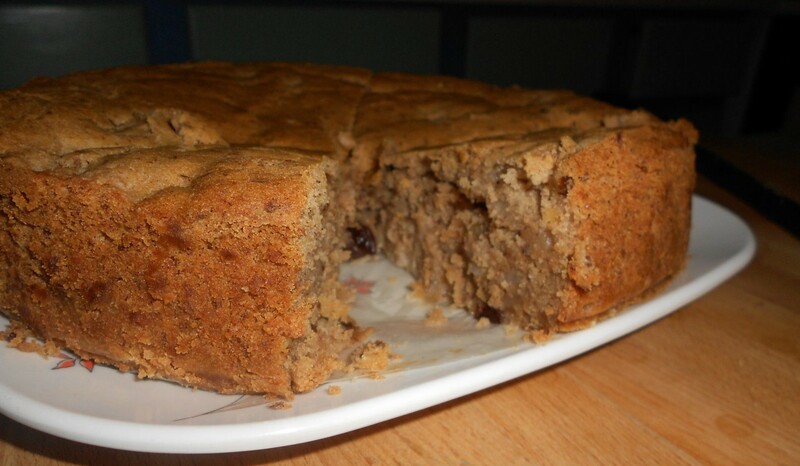 Bake for approximately 60-75 minutes in the center of the preheated 350°F oven, until the center of the cake is firm and a toothpick inserted into the cake comes out clean. Cool for 10 minutes on wire rack. 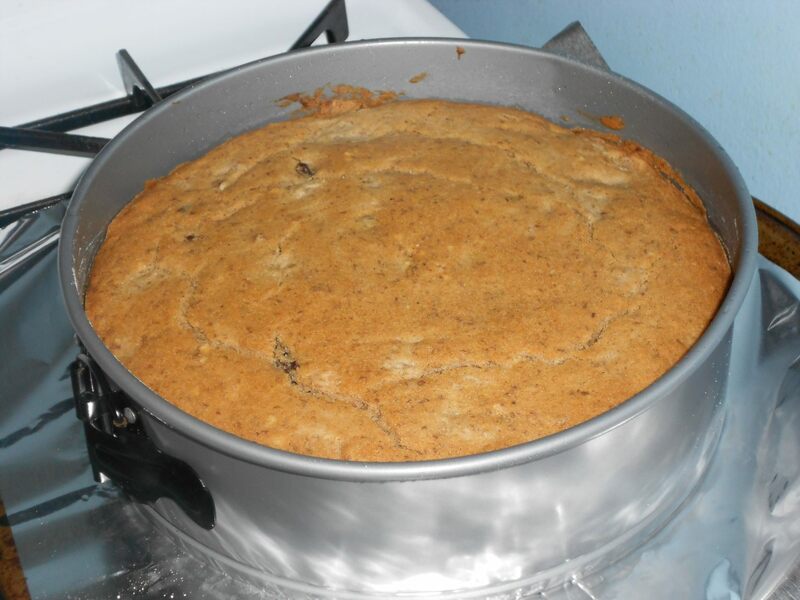 Loosen the outside of the springform pan and gently release, using a small knife to separate the edge of the cake from the edge of the pan, if necessary. 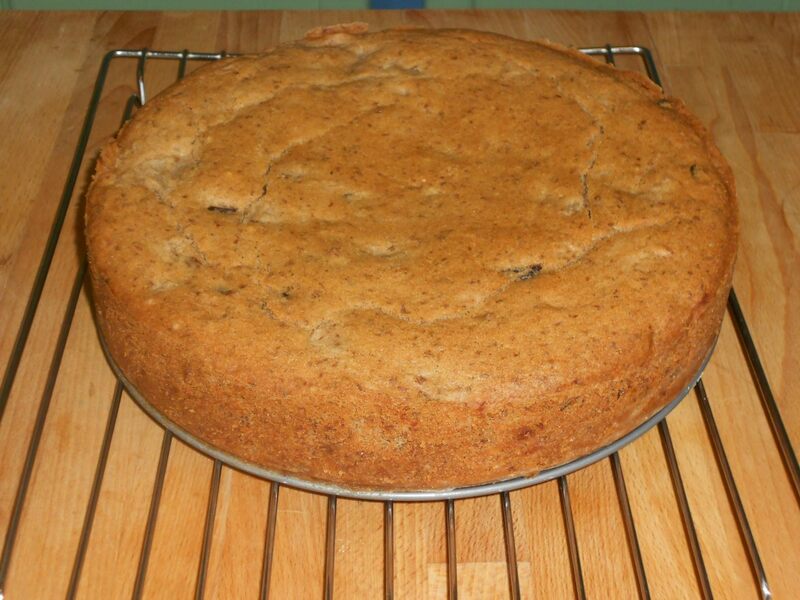 Set the cake, still on the pan bottom, on a wire rack to cool completely, at least 1 hour. My everyday dairy-free “milk” is diluted coconut milk. I take a 14 oz. can of Aroy-D Coconut Milk (according to the information on the can this brand is made from only coconut and water, not preservatives or additives), pour it into a 1-quart container, add 14 oz. of water, and shake. So a 50/50 mixture of coconut milk and water. Feel free to substitute whatever form/brand of dairy-free milk you like. Cream the shortening, coconut manna, salt and vanilla until smooth. Add the confectioners’ sugar in several batches, beating until smooth after each addition. Add the coconut milk, one tablespoon at a time until the frosting is the consistency you prefer. Continue beating until smooth, light, and fluffy. 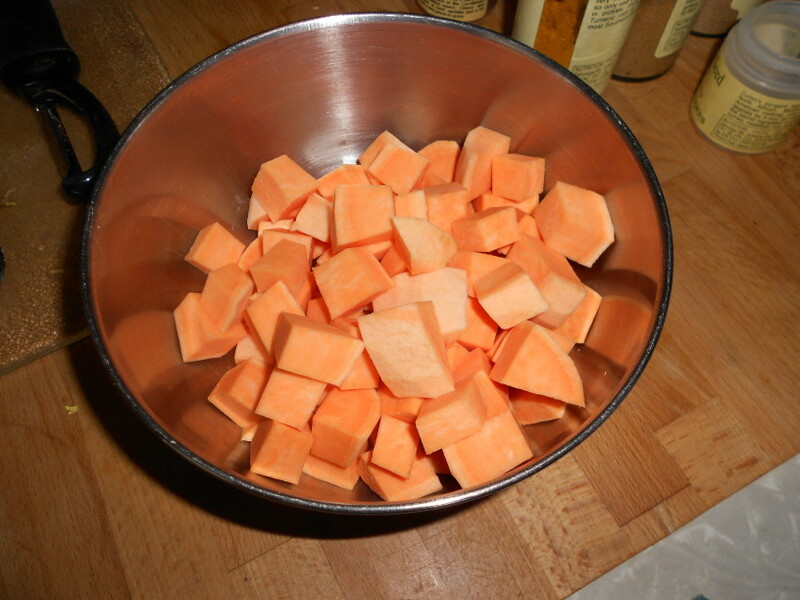 Makes enough for 12 large cupcakes, an 8″ layer cake, or the top and sides of a 9″ single-layer cake.